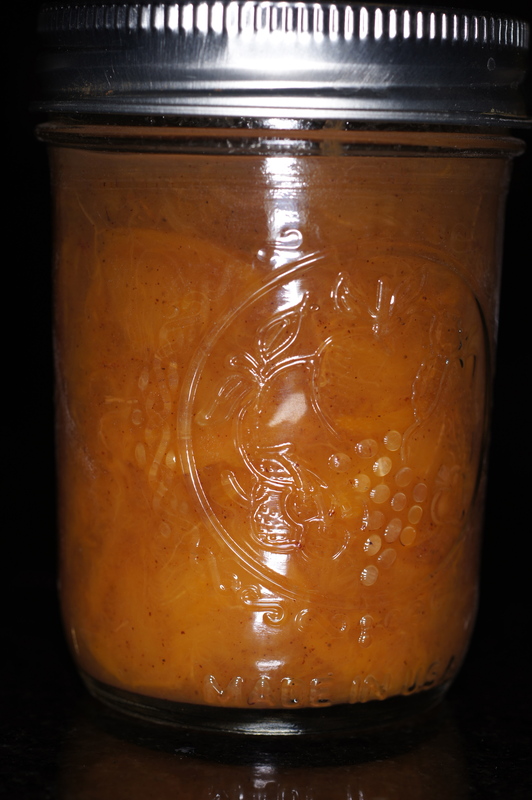 OK. Last post on Peach Preserves. I had a lot of peaches. 😮 This preserve tastes like an old fashioned peach pie. Delish! Inasmuch as I had a lot of peaches to use, these past 3 recipes were trying differing preserving techniques in addition to different flavor combinations. The first was a preserve. The second was a butter. 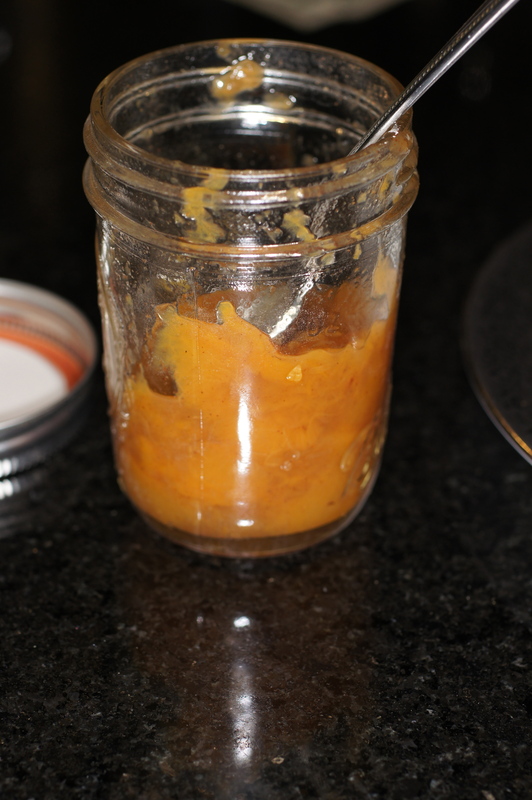 This recipe is also a preserve but it uses pectin for a thickening agent unlike the first recipe which did not. Because it uses pectin as a thickening agent, this recipe does not need as much sugar and is not nearly as sweet. 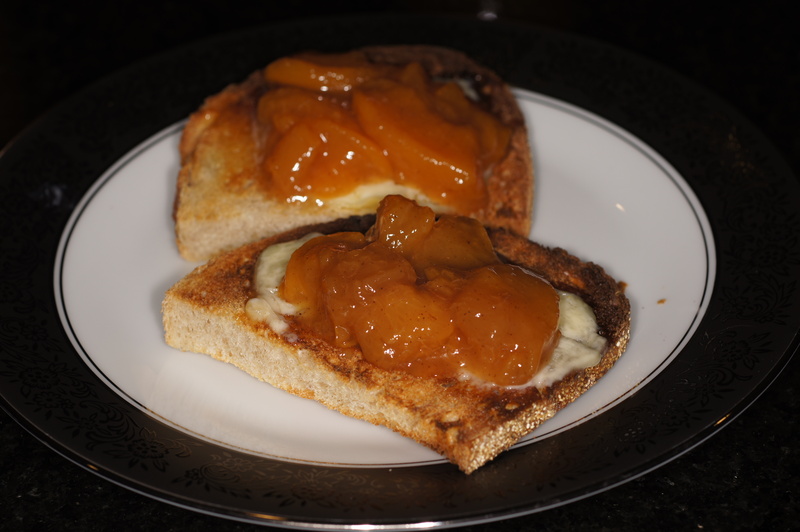 It really does taste like a peach pie and is wonderful on toast. Your family will love this preserve. In large pot, combine peaches, sugar, lemon juice, cinnamon, nutmeg, and cloves. Over medium high heat, bring to a boil, stirring occasionally. Let boil for 15 minutes, or until peaches have been crushed into smaller pieces. Turn heat up to high and bring to rolling boil. Add fruit pectin, stirring constantly, and bring back to a rolling boil. Let boil for one full minute, stirring constantly, until starting to thicken. Remove from heat, skim foam from top, and ladle into prepared jars, leaving 1/4-inch head room. Process for 10 minutes in a boiling water batch. May be stored for up to a year so you can enjoy this long after peach season is gone. Enjoy! Pectin, better living through chemistry! Also, nice choice of spices in this recipe, REM. Food chemistry is interesting stuff. Nowadays, it’s an essential part of your diet and not always for the best. Glad you like the recipe. Thanks for dropping by and your nice comment. No peach tree. I had one many years ago and it was nice. Peaches are appearing everywhere in Texas right now. They spoil so quickly you have to do something with them very soon after you buy them. This is a nice recipe and really does taste like peach pie.